Spring is right around the corner, which means Summer is around the next one, right? Well, a girl can dream... I know we have some time before June 21st rolls around, but NOW is the perfect time to start forming those travel plans so you don't miss out on all those good deals and a well thought out vacation. We travel a lot as a family, but most of our travel plans are based around work, destination weddings or visiting family. I love that our families live in such beautiful countries like Portugal and Antigua and work trips constantly take us to beautiful new destinations, but it's nice to get in a trip off of your own travel bucket list once in a while and Mykonos, Greece was just that trip for us. from our stay on this magical little island. This super chic beach club was giving us everything we needed! Stunning views, shallow beach water for the kids to play, incredible food, but most importantly the service was outstanding. We went there several times over our 10 day stay just to get that attentive treatment from the waitstaff. Also, it was a great place to meet other families with children. If super chilled, unpretentious, boho vibes is what you're looking for, Ftelia Beach is your spot! This place is as family friendly as they come. Loads of kids running around, playing in the still, shallow waters while parents are kicked back on bean bags, ordering pizza and wine to the beach from the yummy restaurant upstairs. We spent a few memorable days kicking back here. 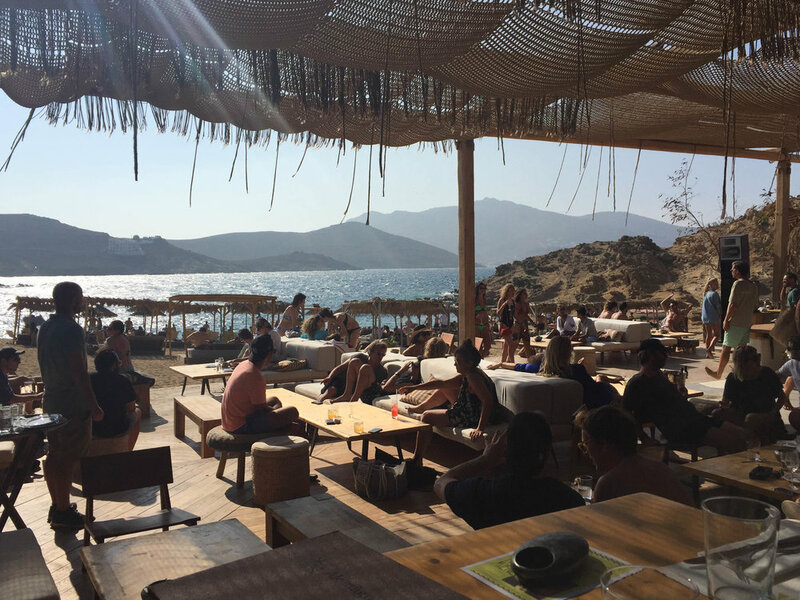 This boho - ultra chic beach bar seemed to be a favorite amongst the international fashion set. We were pleasantly surprised to see some familiar faces here as we lunched after chilling on the beach all morning. I was convinced the view made everything we ate taste 10x better. Along with the stunning view, I loved the overall vibe. The food, music, decor, scene.. It's a cool spot if you feel like injecting some "to be seen moments" into your vacay. Make sure to come early if you have children since it's not that family friendly after the sun sets. 4. Watching The Sunset at Nice and Easy, Mykonos Chora, Alefkantra Sq. I've never seen a sunset like this in my life. The the shades of orange and purple kept moving and changing with every second. It was like a second dessert after our tasty meal. This indoor/outdoor restaurant on the edge of the water was the perfect choice for our last meal in Mykonos. No holiday is complete without feeling the heartbeat of your destination. The people from Mykonos are so warm and friendly, which made shopping a load of fun! I loved getting lost in the maze of the winding, white streets filled with shops in the center of town with the family. We found some really cute things for ourselves, our home and a few peeps back home. My favorite part was picking out bracelets for me and sandal shopping for for Luke! Overall, Greece was magical! I fell in love with the spirit of the people, the food, the weather and this unexplainable mystic feel in the air. We had a great time beaching around making lasting memories with the children. I will most certainly go back and hopefully get a chance to see some other islands next time! Hope this sparks some happy holiday planning!